This journal has been a labor of love for me. A love of all the health things I love, outside of just working out. A love of helping others see and reach their potential. A love of making health about fun and self-love. I believe my updated online offering will provide greater accountability for those participating. In addition, it will be a great tool for those needing a boost in reaching their goals. As you can tell, I am just so excited to get this journal and program out into the world, to help everyone wanting help. Feeling like they have tried everything and nothing sticks. Finding information overload and action paralysis. All these changes are for you! Intrigued by the journal, wondering if this could be the program that makes the difference for you? I encourage you to sign up for a call with me. We will lay out the steps to reach your goals. The link to order the journals is nearly ready, and I will share a link with you as soon as they are hot off the presses. Not the phone call, chat with me kinda person? No problem, reach out by commenting here, by emailing me, or DM me on social media for a link to purchase the journal as soon as they are ready. I’ve revamped my virtual training program and am excited to share a few of the changes. First up, the 1 on 1 goal setting call I mentioned above, use this link to schedule! We will set up to three goals along with up to five action steps to help complete those goals. The journal is your partner through the entire process. 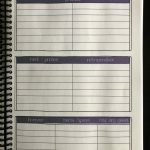 Space to write your goals, set your words of intention, track your food and log your thoughts all to help you move towards a healthy lifestyle that will stick. Over time, action paralysis can cause inaction, even when you are given the steps you need to take. This is where the accountability comes to the rescue. The new online Becka the Pocket Trainer, walks you through all three months with the journal. Each week, we cover a different focus area. I will also share a new recipe to try each week too. On Sundays, you will send me your workout and exercise plans for the week. Using the goals we set in your one on one call, I will make some critiques and suggestions to make your plan even healthier in the future. You will have my reply to your plan by Wednesday, giving you ample time to apply items to the following week’s plan. There is a weight tracker in the journal, however, I believe the scale is just one tool to help measure success. It isn’t the best tool, in fact, I don’t like when a weight loss is a person’s goal. You are not actually in charge of what the scale says. You are in charge of how many servings or vegetables you eat, how many ounces of water you drink, and so many other healthy things. Making yourself healthy from the inside, that will cause a drop in the scale. Focusing on the scale, that can often set oneself up for failure. This is why the one on one call is so valuable. We will dig deeper than, I want the scale to say a particular number kind of goals. 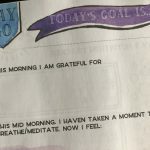 The journal also has space for a gratitude practice. The science behind writing what you are grateful for is so overwhelmingly powerful these days. We also will be doing a 30, 60, and 90 day reviews within the journal. Giving you an opportunity to re-evaluate what is going well, where you need to improve, and what successes you can continue to build upon. The online program pairs perfectly with the journal, keeping the momentum going. 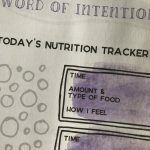 I have written about journaling and goals often, you can even complete a journal activity with this post from 2015. Want to grab a copy of my brand new Health and Fitness Journal? Click the button below!